This two-album anthology was created to celebrate the launch of the Milken Archive’s new website. It features a sample track from each of the archive’s 20 thematic volumes. 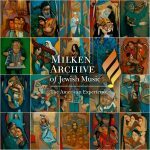 The Milken Archive of Jewish Music: The American Experience has launched a new website (milkenarchive.org) that allows visitors to experience virtually every piece of music and every composer that the archive has recorded since its founding in 1990. The extensive collection – which includes more than 600 works comprising 1,800 individual tracks, 200 composers and 800 hours of oral histories – is organized into webpages that contain links to all of the available related media content collected and created in the course of the archive’s historic work. “This new site is a vast repository of a musical culture that has continually redefined and reinvented itself as it has responded to the opportunities and challenges of life in a land of freedom,” according to Milken Archive curator Jeff Janeczko. The new mobile-friendly platform offers a rich experience on a variety of devices to accommodate the diverse needs of Milken Archive’s audiences. From documentary videos and photographs to extended oral histories and articles, each page exists within the context of the cultural and historical narratives that have defined Jewish life in America for the past three-and-a-half centuries. In celebration of the new site, a digital anthology is available free to all individuals who sign up at the archive’s website. Ten winners will also receive five albums of their choice; five winners will choose 10 albums. A grand-prize winner, chosen at random, will have unprecedented access to all 1,800-plus tracks contained within the archive’s 20 thematic volumes. The deadline to sign up for the free album and contest is Sept. 26. The Milken Archive repertoire on the free two-album anthology features one sample track from each of the archive’s 20 thematic volumes. On Album 1, there is: 1. Ikh Bin a “Boarder” Bay Mayn Vayb (I’m a Boarder at My Wife’s) by Rubin Doctor; 2. Celestial Dialogues: IV, Adonai Melekh (The Lord is King) by Ofer Ben-Amots; 3. L’kha Dodi (Welcome, Sabbath Bride) by Aaron Bensoussan; 4. Eshet Hayil by Benzion Shenker (arranged by Stanley Sperber); 5. Hear O Israel: IV, Sh’ma, by Jonathan Klein; 6. Violin Concerto in C Minor, “Nushkaoth,” by Sholom Secunda; 7. Two Hannah Szenesh Poems: II, Ashrei Ha-garfur, by Max Helfman; 8. Amar Rabbi, Elazar, by Moishe Oysher; 9. Stempenyu Suite: III, Freilechs, by Joseph Achron; and 10. Di Naye Hagode: Riboyne-Sheloylem (The New Haggadah: Master of the Universe) by Max Helfman. Album two comprises: 1. Mayn Rue Platz (My Resting Place), anonymous, arranged by R. Williams; 2. Canticles for Jerusalem by Vivian Fine; 3. Kol Nidrei, Op. 47, by Max Bruch; 4. Ki K’shimkha by Paul Discount; 5. Shofar Service: I, Malkhuyyot, by Herman Berlinski; 6. Genesis Suite: IV, Cain and Abel, by Darius Milhaud; 7. The Day of Rest by Sholom Kalib; 8. Aleikhem Eda K’dosha, traditional; 9. Akavya ben Mahal’el Omer by Lazar Weiner; 10. The Merchant and the Pauper, Act II, Scene 4 (excerpt) by Paul Schoenfield. Since its creation by philanthropist-businessman Lowell Milken, the Milken Archive has achieved a reputation that extends internationally. The 50 CDs released by Naxos American Classics between 2003 and 2006 gained widespread recognition, including Grammy and ASCAP awards, and the nationally broadcast radio series hosted by Leonard Nimoy has introduced the archive to countless listeners.